Upgrade your audio without depleting your wallet. Whether you're interested in piecing together a surround sound setup for your home theater or want to add some thunderous audio to your PC, Newegg has a few marked down items from Klipsch that you might be interested in. 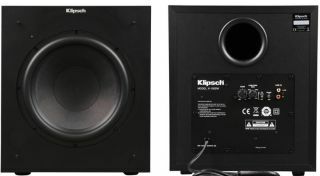 One of them is a 10-inch powered subwoofer (k100-sw) from Klipsch's Reference series line—Newegg has it on sale for $150, down from $250. The subwoofer pairs an all-digital amplifier capable of delivering 100/250 watts of dynamic power with a 10-inch poly-fiber front-firing woofer. It also has a low-pass crossover and phase control. Audiophiles might turn their noise at a subwoofer in this price range, but if you put much stock into user reviews, there is a lot of praise for this unit on the web. Newegg also slashed the price on Klipsch's KF-28, a floorstanding speaker with dual 8-inch magnetically shielded IMG woofers. The MSRP on one of these is $450, though they're currently available for $180 each. That means you can snag two for less than what one of them is supposed to cost. The floorstanding speakers also feature a 1-inch aluminum tweeter and use Klipsch's proprietary Tractrix horn technology. Like the 10-inch subwoofer, there is a lot of praise to be found for these speakers. If you're interested in either of these, be aware that the sale is good for today only on both items. You can find the 10-inch subwoofer here and the floorstanding speaker here.